Some clarity was reached today on how the city figures to spend $185.4 million in so-called “windfall” funds, after the Budget Committee moments ago passed an appropriation item following nearly four hours of impassioned public testimony. After today’s 3-0 committee vote — to establish a reserve fund enabling teacher raises, and putting scores of millions toward homeless, housing, and education programs — the legislation will move to a special Monday Budget Committee meeting, a step required because of the substantive amendments approved today. From there, the item will move to Tuesday’s full Board of Supervisors. (This isn’t actually a windfall. We will, barring a natural or manmade disaster, be receiving such “windfalls” every year now for the foreseeable future. More on that in a moment.). A litany of speakers appeared before the supervisors today, where many advocated for full funding of teacher raises through the lifetime of the current contract with the teachers’ union. And yet, as Mission Local broke yesterday, a deal was struck Tuesday — one that, we’re told, explicitly satisfied the union, the San Francisco Unified School District, and every progressive supervisor. This deal, markedly, did not appear to satisfy advocates for the homeless, who expressed their sorrow and disappointment today. But what this compromise did do is mitigate the demand from the teachers’ union and its allies of $60 million — up front — from the $185.4 million pot, to cover raises until 2020-21. This is a demand that, no matter how reasonable, would provide teachers with more money-and-time guarantees than others clamoring for these funds. Instead, Supervisor Gordon Mar proposed the creation of the “Teacher and Early Care Educator Unappropriated Emergency Reserve Fund.” This would draw from the $52 million already gleaned from the “windfall” money for “rainy day reserves,” and, as needed, use this fiscal safety net to free up money for ongoing teacher raises. $111.4 million for “affordable housing,” including $40 million for small-site acquisitions; nearly $50 million for affordable housing development; $9 million for upgrades at Sunnydale and Potrero Public Housing; and $14 million for affordable housing site acquisition. $10 million for early-care educator “wage adjustments and reimbursements”; and $14.5 million for acquisition of “public power and energy efficiency” projects. The spending package advanced today by the Board funds a multiplicity of priorities; Mayor London Breed, politically pivoting following her decision to oppose homeless measure Prop. C, has pushed for all of these funds to instead go to homeless programs. With eight aye votes on Tuesday, the board would present the mayor with a veto-proof majority. Only the three Budget Committee members voted today, but it was a “committee of the whole,” so everyone showed up. The comity expressed by the seven other supervisors on hand indicates this package will likely achieve passage, and eight ayes — or even a possible unanimous 11 ayes — appears highly attainable. Supervisors Vallie Brown and Ahsha Safai, in fact, asked today to be listed as co-sponsors. (And, if you read yesterday’s article, you can just skip to the next section). In 1992, with the state of California in a bleak place economically, Sacramento created a shell game that allowed it to shunt more of the burden of funding schools to the state’s cities and counties. It mandated a percentage of counties’ property tax hauls be directed into “Educational Revenue Augmentation Funds” administered locally and directed toward school and community college districts. In San Francisco, 25 percent of property taxes go into ERAF, supplementing 9 percent already funneled directly to public schools and City College. Following the ’92 implementation of the “Educational Revenue Augmentation Fund” in all 58 counties, the state reduced its funding of schools by however much ERAF gathered — a neat, diabolical fiscal and semantic trick: Funding was never “augmented.” And the excess dollars the city is now spreading around aren’t “educational funds.” They’re dollars placed into a pool the state created to shirk its own school funding duties and, exceeding the state-dictated cap, are redirected back to the counties. These excess funds weren’t going to schools so they weren’t taken from schools. While reallocating ERAF funds would be complicated in parts of Southern California — where there are seemingly endless overlapping counties and school districts — San Francisco is a combined city-county with only the SFUSD and City College. The pile of excess money is undivided. And San Francisco finds itself with this pile because property taxes have spiked 22 percent in the past two years alone (from an already stratospheric level) while our public school enrollment is stagnant or dropping. This combination has already led to yearly “windfalls” in Marin, Mono, Napa, San Mateo, and Santa Clara counties. As Mission Local wrote yesterday, the narrative that these funds were a one-time Golden Ticket is false. They will come again, “barring state action,” as cautious bean-counters and legislators are wont to warn. But what constitutes “state action”? Well, it would require a state flush with cash making a money grab. It would require this to be done over the objections and resistance of Sen. Scott Wiener, Assemblyman David Chiu, Assemblyman Phil Ting (the budget chair, notably), and Gov. Gavin Newsom — who also used to work here. That’s what it would take to “work around the edges.” But to really make wholesale changes and do away with this funding source would, per the California Legislative Analyst’s Office, require a statewide vote. It would be irresponsible for San Francisco to fund ongoing needs with one-time funds. But these are not one-time funds. With money coming yearly for the relatively foreseeable future, a broader set of priorities could be explored. 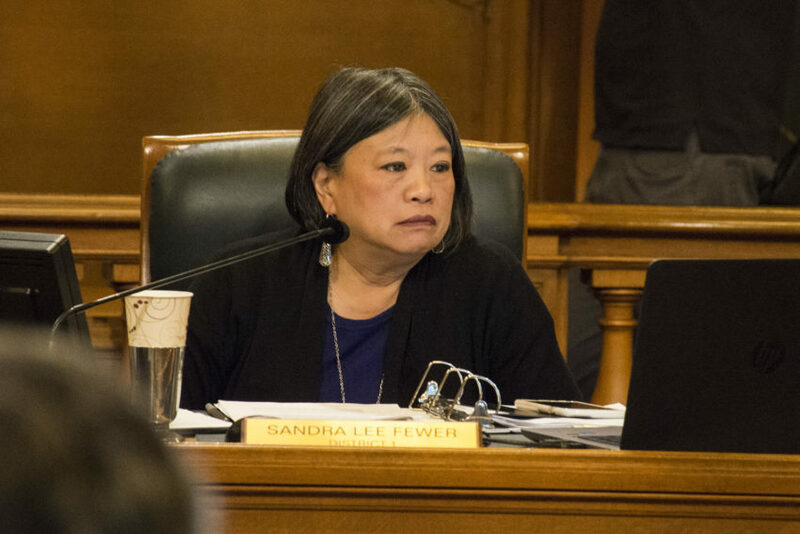 It was a bruising opening stanza of Supervisor Sandra Lee Fewer’s term as Budget Chair. But, it appears likely, a successful one. Photo by Lola M. Chavez. One. Mayor London Breed has been adamant about using these funds as a bridge to fund homeless/housing services while Proposition C is adjudicated. But we wouldn’t be having this discussion — and pitting teachers against the homeless; the have-nots against the have-nothings — if the mayor et al. had supported Prop. C, enabling it to pass the two-thirds voter threshold and staving off years of potential litigation. 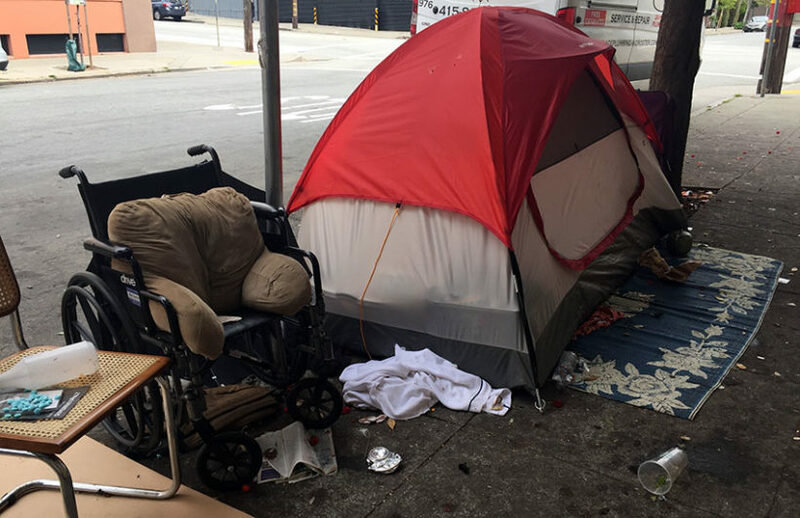 In pushing for this ERAF money to go to the homeless, the mayor is advocating workaday San Francisco home- and property-owners’ taxes go to fund the homeless, but she was adamantly against taxing the Jack Dorseys and Marc Benioffs of the city to generate even more. Two. Not only are these not “windfalls,” other counties have actually devised prudent rules on how to responsibly administer excess ERAF money. San Mateo in 2011 (2011!) determined that 50 percent of the money should go toward long-term uses and 50 percent on one-time expenditures. This caution is not due to fear of “state action” yanking away these dollars but because this is a volatile and unpredictable revenue source. San Francisco would do well to come up with rules regarding how to best allocate this new revenue source, lest every year’s debate devolve into a melodramatic brawl. Three. Just a reminder that this was an argument over one-fifth of one billion dollars in a city with a budget exceeding $11 billion — and that there are apparatchiks within the mayor’s office you’ve never heard of making fiscal decisions exceeding the clout of any elected supervisor. Or, perhaps, all of them. Your memory is shorter than mine, Joe. When Proposition 13 was passed in 1978, 30% of San Francisco’s property tax lien was going to SFUSD. 30% continued to be allocated to SFUSD until, in July 1979, the Legislature handed most of it to the City/County, leaving SFUSD with just 8.5%. (Compare that with most other unified districts in the state, which get more than 35%.) The Community College district was sliced from 5.5% down to 1.4%. The ERAF shift in 1992 reclaimed 24% of the total tax lien for the benefit of local education (both City College and SFUSD). The final result — just over 35% allocated to educational purposes — mimics the situation in 1977, when voters last had control over specific levies. The idea that SFUSD has to go, hat in hand, to the City to beg for a fraction of that excess ERAF explains why families flee the city. It is time to demand that the Legislature include a regional cost supplement of at least 24% to the Local Control Funding Formula, which would reclaim $138 million for SFUSD.